← Microsoft Virtual Academy’s new more agile approach to Azure IT Pro training. 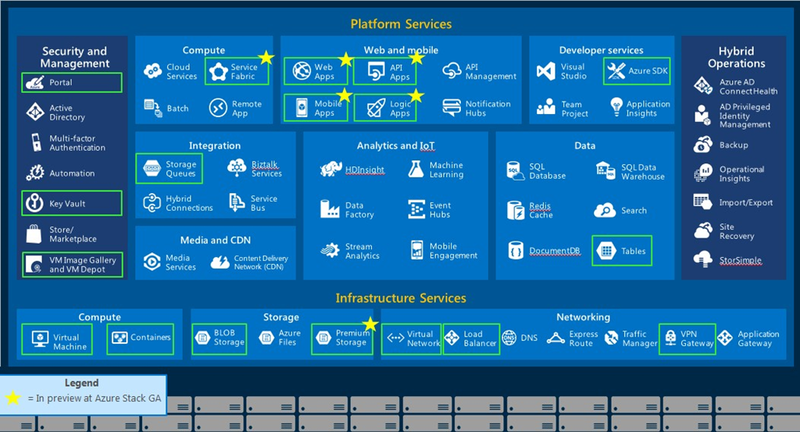 The Future of Azure is Azure Stack! I realize that the title above might be a bit controversial to some. In this blog post I will attempt to defend that position. 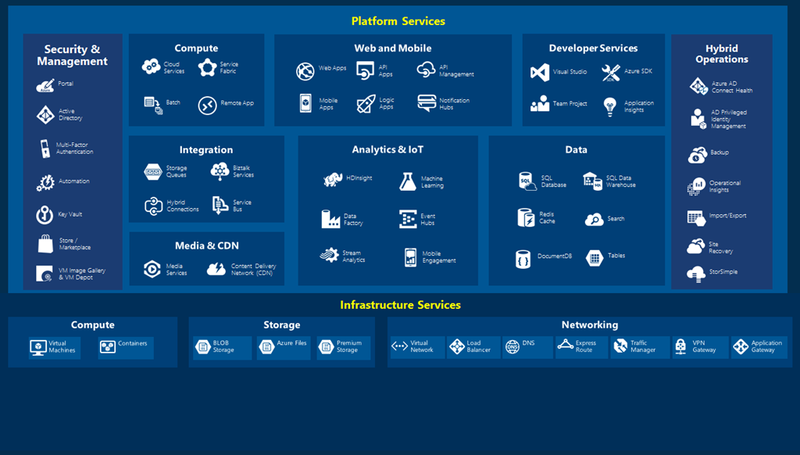 The two diagrams above, taken from recent Microsoft public presentations, symbolically represent the components of Public Azure and Private Azure (Azure Stack). If you think that they have a lot in common you are right. Azure Stack is Azure running in your own data center. Although not every Azure feature will be delivered as part of Azure Stack at its initial release (and some may never be delivered that way because they require enormous scale beyond the reach of most companies) , it is fair to say that they are more alike than they are different. Back in 2012 I wrote a blog post on building cloud burstable, cloud portable applications. My theses in that post was that customers want to be able to run their applications on local hardware in their data center, on resources provided by cloud providers and/or even resources provided by more than one cloud provider. And that they would like to have a high degree of compatibility that would allow them to defer the choice of where to run it and even change their mind as workload dictates. That thesis is still true today. Customers want to be able to run an application in their data center. If they run out of capacity in their data center then they would like to shift it to the cloud and later potentially shift it back to on-premises. That blog post took an architectural approach using encapsulation and modularity of design to build applications that could run anywhere. A bit of additional perspective might be useful. Back in 2007 I was working as an Architect for Microsoft and I came across what would eventually become Azure. (In fact that was before it was even called Azure!) I had worked on an experimental cloud project years before at Bell Labs called Net-1000. At the time AT&T was planning on turning every telephone central office into a data center providing compute power and data storage at the wall jack. That project failed for various reasons some technical and some political, as documented in the book The Slingshot Syndrome. The main technical reason was that the computers of the day were minicomputers and mainframes and the PC was just emerging on the scene. So the technology that makes today’s cloud possible was not yet available. Anyway, I can say that I was present at the birth of Azure. History has proven that attaching myself to Azure was a pretty good decision. What many do not know is that this is actually Microsoft’s third at tempt at providing Azure in the Data Center. Back in 2010 Microsoft announced the Azure Appliance which was to be delivered by a small number of Vendors . It never did materialize as a released product. The very first appearance of Azure Stack was in the form of a private preview, and later a public preview: “Azure Stack Technical Preview 1”. During the preview it became clear that those attempting to install it were experiencing difficulties, many of them related to the use of hardware that did not match the recommended minimum specifications. Since Azure Stack is so important to the future of Azure Microsoft decided to release it in the form of an Appliance to be delivered by three vendors (HP, Dell & Lenovo) in the Summer of 2017. According to Microsoft that does not mean that there will be no more technical previews, or that no-one will be able to install it on their own hardware. (It is generally expected that there will be additional Technical Previews, perhaps even one at the upcoming Microsoft Ignite! conference later this month.) It simply means that the first generation will be released in controlled fashion through appliances provided by those vendors so that so that Microsoft and those vendors can insure its early success. You may not agree with Microsoft (or me), but I am 100% in agreement with that approach. Azure Stack must succeed is Azure is to continue to succeed. This entry was posted in Azure Stack, Cloud, Cloud Computing, Microsoft Azure, Windows Azure and tagged Azure, Azure Stack. Bookmark the permalink. 2 Responses to The Future of Azure is Azure Stack!